This is an expansion to the Baseball Highlights 2045. 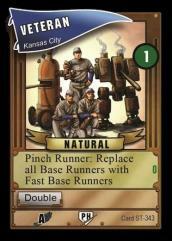 Playing this fast-action card game is like watching TV highlights of early 21st-century baseball games, with the game play being full of theme with no outs or innings and without bogging down in a play-by-play baseball simulation. In this quick and interactive game, two players build their teams as they play, combining both strategy (building your team) and tactics (playing the game) without any of the downtime. During each "mini-game", each player alternates playing six cards to simulate a full game's highlights. The mini-game includes defensive and offensive actions, and your single card play may include elements of defensive and/or offensive plays. Do you try to thwart your opponent's pending hits, put up strong offensive action of your own, or use your better players to do both? Players buy new free agents after each mini-game to improve their roster, and the team who wins the most mini-games in the series is the champ!